These days, even award-winning authors in our industry must invest time and energy to market a new book. 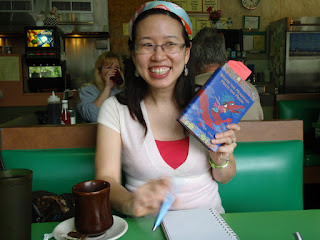 Last month, author and illustrator Grace Lin (WHERE THE MOUNTAIN MEETS THE MOON / Little Brown) tried some new strategies to launch her book online. I asked Grace a few questions about the experience, hoping that other authors and illustrators might glean a few ideas for their own virtual efforts. Why did you decide to launch your book online? This book, in particular, is really important to me so I really wanted to pull out all the stops to help it do well. Unfortunately, the book was launching at the end of June which I thought made it difficult to do many in-person events — almost everyone scatters for the summer around then. Doing something online seemed the most sensible route to take for this time; I'll probably start doing in-person events for it in the fall. Could you sum up the elements of your online book launch? 2. Created a "behind the story" movie. 3. Set up a personalized store at CafePress.com. 4. Taped an audio of me reading an excerpt of the book. 5. Offered a one-day party favor of a special edition personalized autographed bookplate. 6. Promoted a 3-month contest where if you post a photo of yourself with my book on my Facebook Fan Page, you can win a $25 gift certificate for my store and the grand prize of your likeness in my next book. 7. Invented Facebook quizzes related to the book (see sidebar for a list of all the quizzes). 8. Created a book launch site and registered a customized domain name using the title of the book at blogger.com. 9. Offered a downloadable activity book. 10. Generated a music playlist at playlist.com. 11. Went on a blog tour. 12. Joined Twitter and imported my blog posts there using twitterfeed.com. How much time do you estimate you spent? A lot. I can't even guess. I have a friend who edited and put together the movie and trailer. I know that took him weeks. I hired Kirsten Cappy of Curious City to create the content for the activity book. And you, Mitali, helped me figure out how to organize it and get the word out! But the rest was all my sweat. If you had to pick one, which one was the easiest to do and why? The easiest thing to do was to start a Facebook Fan Page. Once I found the links on how to do it on Facebook, it was a breeze. And it's been a great way to keep in contact with fans. Making the interview/movie was challenging. I am horrible on camera and I tend to stutter and talk a mile a minute. Not to mention all the technical problems — microphone issues, lighting, etc. To make that 4 minute movie we shot at least 2 hours! But getting the word out, having people actually COME to the party — that is the trickiest and most challenging thing. Because, you don't really know — you just hope the word spread and people show up. I got a big kick out of making my Facebook quizzes. They are just goofy fun. I still send them to my friends to take. What did you do in person (offline) to promote the book? I did one big launch party in June at the Porter Square bookstore. I like to think of launch parties like birthday parties; I try not to think what would be the most effective marketing but what would make the guests have the most fun. So, compared to some it might have seemed a bit lavish. But, to me, it was a party I was hosting and I wanted to make sure everyone had a nice time. So, for my launch, I gave a little speech, signed book and I gave elaborate goodie bags. The bags had a poster, an activity page, a paper flower and a boxed cupcake. On the bottom of 8 of those cupcakes, I taped a Chinese coin. If you got a cupcake with a coin, you got your likeness in my next book. The kids were thrilled and it was a lot of fun. I would have started my Facebook Fan Page a lot earlier. I think it's a great communication tool that I've only just begun to understand. Also, I would've started twittering earlier too, I still have not really grasped it — I imagine if I had mastered it before my launch it would've been helpful. Thank you, Grace, for sharing your creativity and energy. Not all of us are as talented as you, but I know you'll inspire others to take some risks for their next book launch.